The Grunfeld Defense has always been a popular choice with players who aim to counterattack with the black pieces. World Champions Bobby Fischer and Garry Kasparov head a distinguished cast of grandmasters who swear by its solid yet dynamic nature. 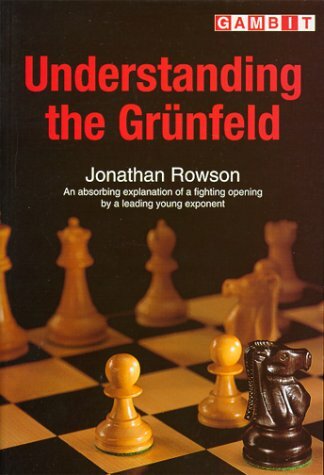 In this original book Jonathan Rowson delves deeply into the Grunfeld, steering the reader through the mysteries and intricacies of this complex opening. Now you too will be able to understand, play and win the Grunfeld! Scotland's Jonathan Rowson is one of the most talented young players on the chess scene. A string of impressive results include a silver medal at the 1997 European Junior Championships and first place in the 1997 London International, where he earned his first grandmaster norm. His second grandmaster norm came in the British League the following year. He is already an experienced chess writer, but this work is Rowson's first major book. He is currently studying Philosophy, Politics, and Economics at Oxford University.